Tick-tock, tick-tock, tick-tock. The sound of an old-fashioned, wind-up clock ticking off the seconds grounds me in the moment. Yet, no matter how you slice it, a day only contains 24 hours or 1,440 minutes or 86,400 seconds. No more and no less. Why then do some days pass quickly while other drag painfully on and on? Thomas Jefferson once said, “Never put off tomorrow what you can do today.” While on the surface I agree with that sentiment, it seems the myriad of tasks that need my attention today often spill into tomorrow and the next tomorrow and the next. The question is not so much putting off those things that could be done today until tomorrow, but more on prioritizing those tasks appropriately. Which tasks if I complete today will bring me closer to my goals tomorrow? Which tasks if I put off until tomorrow will cause me to get an overdue charge or lose out on an important opportunity? Which tasks can I put off forever because they no longer matter? If only I had more time to figure it all out! I work full-time as a technical writer. I’m a wife and the mother of two young daughters. In my spare time, I write contemporary romance novels, blog and try to promote my books. I want to be the best employee, wife, mother and author I can. When I focus on one the other areas in my life suffer. I don’t want to settle for mediocrity yet can’t imagine giving any of these roles up. How could I? They all define me and make me who I am. But because of them, I often find myself overwhelmed, irritable and struggling. I struggle with not being good enough, with being satisfied with where I am today and not worrying too much about what tomorrow might bring. I struggle with letting complacency keep me from longing for the perfect tomorrow. And, I struggle to keep that longing from preventing me from happiness today. 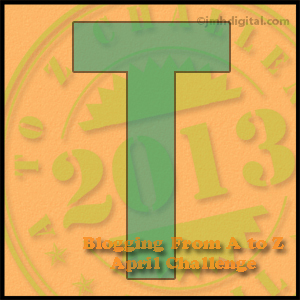 Posted on April 23, 2013 April 23, 2013 Categories writingTags A to Z Challenge, clocks, days, Thomas Jefferson, time, today, tomorrow, writing4 Comments on Today. Not Tomorrow.